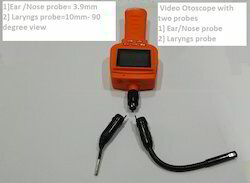 Leading Manufacturer of ear examination camera, throat examination camera, video oto laryngoscope camera and 90 degree laryngs camera from Mumbai. When a patient approaches you with an ENT disorder, he expects a quick and exact diagnosis. MEDICAM helps you to give him that assurance. With our revolutionary VIDEO OTOSCOPE, an innovation that facilitates thorough investigation, in-depth analysis and efficient management of the patient’s condition. 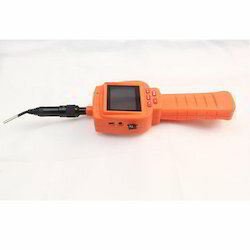 This Video otoscope camera comes with 2.4 inch screen. This unit has a image freezing and saving facility. It also has Video recording function. The data gets stored in memory card which can be downloaded on any computer. The probe is fully waterproof. 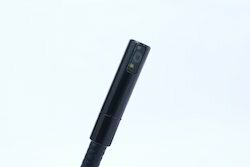 The size of the probe camera is only 3.9 mm which comes wih LED illumination. It is a very good portable device with very good user friendly features. An ideal solution for OPD use. Reliable performance and compact design. 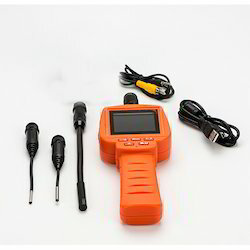 Includes 2.4inch screen with recording facilityand Otoscope Probe. No external scopes, fibre optics or camra required. Easy to carry and user freindly. Images freexomg and storing facility. We have been engaged in providing the wide variety in offered Ear Examination Camera to fulfill requirements of each client. We are a recognized name engaged in providing our precious clients with best in class Throat Examination Camera. We are instrumental in offering a wide range of Baby T Shirt to our clients. Laryngs camera [for adults] is a 90 Degree Laryngs Camera which can be connected to any TV monitor. This is a 90-degree straight camera. This Camera has its own micro LED system.This camera does not require any external Light source or fiber optic. This camera is popular because of it's portable because it can be carried easily from one place to another. Overall it a very productive device at a very reasonable cost.